Is it just a coincidence, or is Carrie Haddad favoring female artists at her gallery? Her upcoming exhibit, Contemporary Painters, features seven painters in a variety of media, and they are all women! Have all the men taken the summer off? Do I see "gorilla boys" picketing Warren Street soon? Not to worry. Haddad is just up to her usual preferential treatment of the female artists. Since men have dominated the art market for so many years, Haddad enjoys giving the women extra exhibit time to make up for it. So, Carrie Haddad Gallery is pleased to announce “Contemporary Painters (Who Just Happen to be Women)”, with new work by Kathy Burge, Donise English and Ragellah Rourke in the main galleries, and a salon-style selection of paintings in the back room by Patty Neal, Allyson Levy, Jenny Nelson and Kate Butler. The exhibit will be on view August 16-September 16, with a reception for the artists on Saturday August 18 from 6-8 PM. The public is invited to attend. "Both abstract and non-representational painting have become more and more popular with my clients," remarks Haddad, "It's not just landscapes anymore." Curating exhibits is one of the most favorite tasks Haddad performs and her tendency towards "gender favoritism" is just a bias we are going to have to accept. The all female roster of this exhibit boasts of some serious talent. 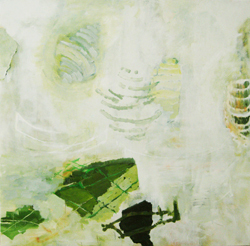 Featured artist, Kathy Burge received an MFA from Yale and has had many successful shows with Haddad. Her large oil on linen canvases are woven with botanical motifs in sweeping, elegant gestures. Donise English teaches Studio Art at Marist College in Poughkeepsie. Painting with melted beeswax and oil on wood panel, she makes colorful and quite post modern-looking works with a twist of attitude. Her sense of humor is also demonstrated in the titles she assigns each painting. Although the imagery in her work evolves each season, the oil and acrylic paintings by Ragellah Rourke begin with the same method of prepping the wood panel with layers of textured plaster which is then incised, sanded, and washed with color. The result of her well worked surfaces is a bit tender, poetic and mystical. Rourke lives in the woods just beyond Albany. Four more artists will hang their work in the Backroom Salon. Allyson Levy "paints" with dead flowers arranged and then covered with melted beeswax. Jenny Nelson's abstract paintings reference the landscape, yet are more surreal than what meets the human eye. Kate Butler will be represented by one, very large and exuberant painting, and Patty Neal will be exhibiting small cityscapes inspired by the very real city of Brooklyn.